This week, Jen H. shares a quote from H. Jackson Brown, Jr. He says, “Enjoy the satisfaction that comes from doing little things well.” With that, we are challenged to share something that brings satisfaction. You can read the entire challenge post here. This challenge got me to thinking about what I find the most satisfying about my various flying activities. There is something special about landing a floatplane on a Minnesota lake, and especially satisfying is the “chirp” the tires make when I land softly on the wheels and the tires go from a dead stop to rolling at 75 miles/hour in but a split second. The task I find most satisfying, however, is the duty of glider towing. 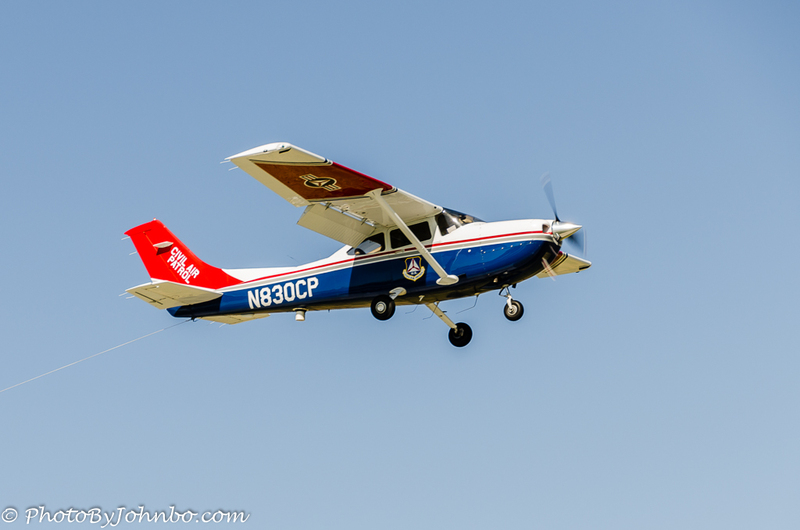 Most of my flying these days is for Civil Air Patrol (CAP), and one of our missions is Aerospace Education. Volunteer pilots provide orientation rides to our cadets, five in a powered aircraft and five in a glider. Glider operations require a tow plane to pull the glider to an altitude that provides a 20-30 minute flight experience for the cadet. That brings me to the opening photo. The aircraft pictured is the one I fly most often when towing. It’s the only tow plane that North Dakota Wing CAP operates. The major difference between a tow plane and our typical CAP aircraft is the installation of a tow hook and release mechanism, and two rear view mirrors that allow the tow pilot to view the glider in tow. In the image above, if you look carefully, you can see the tow rope descending down from underneath the tail. In the image above, one of our glider pilots is being towed solo for the purpose of currency and proficiency. The glider reaches flying speed several seconds before the tow plane. The extra weight and aerodynamic drag on the tow plane and a requirement to not exceed the glider’s design top speed means the tow plane must pull a heavier load and fly at slower speeds than normal. Neither of these parameters is problematic from a safety standpoint, just more demanding of the engine and pilot workload until the glider releases. The image above was captured from a camera mounted in the tow plane’s rear window. 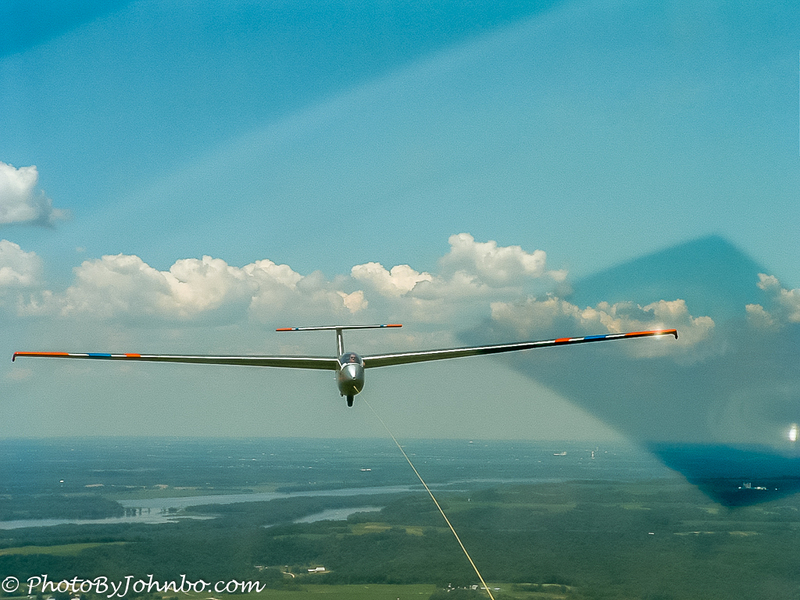 A typical glider tow is to somewhere between 3,000 and 5000 feet (900-1500 m) above ground. During that time, airplane and glider are flying a rectangular pattern always within gliding distance of the departure airport. If the tow rope should happen to break, the glider pilot is always in a position to land safely back at the airport below. A typical tow lasts around 10 minutes and it’s up to the glider pilot to pull the handle that disconnects the rope. It’s then that the fun begins for the two pilot. By convention, the glider turns to the right and climbs while the tow plane turns to the left and descends. This convention ensures a safe separation with virtually zero chance of collision. A quick descent to the airport helps keep flying costs down. 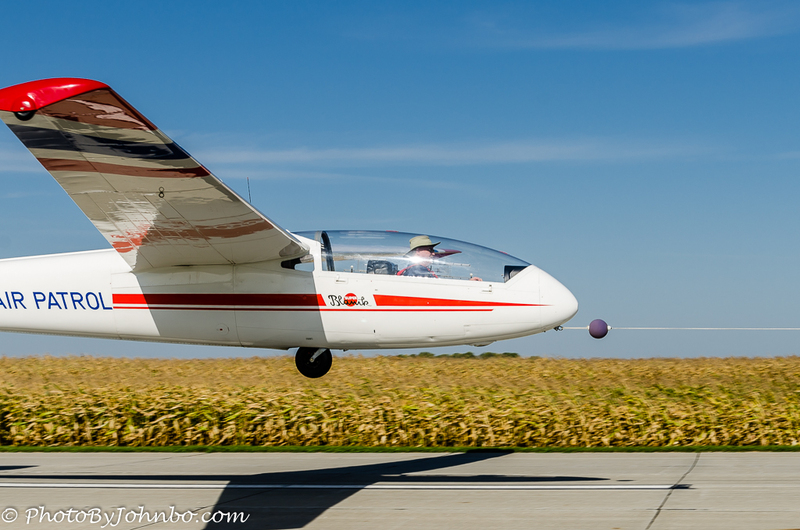 The quicker we get down and shut off the tow plane’s engine, the cheaper the glider flight. The tow pilot cannot just land the aircraft, however. The aircraft is still dragging a 250-foot (76 m) rope behind. It’s the pilot’s job to fly high enough over the runway to drop the rope safely at the runway edge as close as possible to where it needs to be for the next glider flight. From that point, a quick descent and landing using textbook short field landing procedures is called for. The only exception in the textbook procedure is that only enough braking is used to ensure the plane rolls to the end of the runway. From there, a taxi back to the hookup point, then engine shut down to await the glider’s next flight. If gliding conditions are right, the glider could stay aloft for an hour or more, but usually a batch of cadets are awaiting their flight so we typically limit flight time in the glider to 20-30 minutes. It’s during that time that the tow pilot can bask in the satisfying glow of that perfect landing… or fret and stew about how that last landing should have been improved. Tow pilots, by the nature of the task, get to be quite accomplished at landing their aircraft. In a typical glider day, 15-20 take-offs and landings are average when a couple of tow pilots share the day’s towing schedule. Sounds like such a fun way to spend a day. It is, indeed! Thanks for stopping by! since i have flown gliders since i was a youngster i like this one a lot :)…. I hope that tow rope on the power lines wasn’t what led to your missing him. I’ve been lucky in that regard, so far. At one point, one of our tow pilots snagged a runway approach light. Those are designed to break away, however, so it cost the pilot a couple hundred to replace the light. Thanks for stopping by. Must be glorious up there John – beautiful captures. Hope you weren’t taking your eyes off the wheel to shoot the photos LOL!